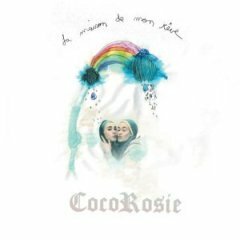 I have to admit that I've raved about Coco Rosie in the past without even really hearing them. Well I've heard them now, and I'm relieved to find that I was within my rights to take the stance I did. I'd become very familiar with Terrible Angels after randomly discovering it on an internet music service (Pandora from memory). It strikes me how similar this is to a lot of the stuff I've been listening to in Berlin lately - Goldmund goodness like Golden Disko Ship. The fact that this is close to blues dawned on me when listening to Jesus Loves Me. This sounds so much like Sister Rosetta Tharpe that I have to wonder if it's a cover. Acoustic guitar, twisted female vocals and beats formed from the scraps and rattles of found sounds. Every track, varied as they are, is great. Check out By Your Side, it's adorned with the sort of loop/hook that the hip-hop heads strive for. Great to finally hear the whole work.